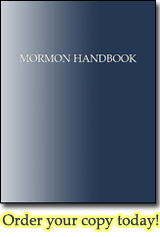 The Book of Mormon is part of the "Standard Works" of the LDS church, which also includes the Doctrine and Covenants, Pearl of Great Price, and the King James Version Bible. The Book of Mormon narrative follows the journey of ancient Jews who migrate and settle the New World, culminating in the resurrected Jesus Christ visiting the inhabitants of the Americas. According to the narrative the first migration (Jaredites) occurred around the time of the Tower of Babel (2500 BC). The second group to migrate were the Nephites in 600 BC, followed shortly thereafter by the Mulekites. When the Mulekites arrived the Jaredites were extinct. The bulk of the Book of Mormon follows the Nephites as they settle the Americas. The unrighteous (Lamanites) are cursed with dark skin, and split from the Nephites. By 421 AD, the Lamanites had exterminated the Nephites. Mormons believe that Native Indians are the ancestors of the Lamanites. The Book of Mormon claims that the truthfulness of it can be determined not by analysis but by prayer. Moroni 10:4 - Should we pray about the Book of Mormon?